IN his continuing search for the more weird, wacky and wondrous in the world of travel, David Ellis says that after laying abandoned for years because people believed it was haunted, a picturesque old hotel in the mountains 30km south-west of Bogota in Colombia has taken on a new lease of life as a museum. 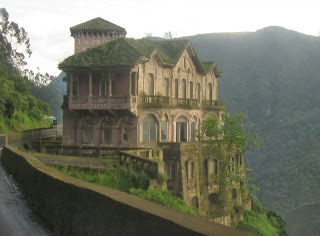 The once-luxury Hotel del Salto was originally built as a private mansion and converted to a hotel in 1928; it was an immediate hit with honeymooners and others visiting the spectacular nearby Tequendama Falls, but with increasing contamination of the Bogota River interest in the 160m high Falls waned and the hotel closed in the early 1990s. Despite several proposals for its re-opening the hotel's doors remained locked – many locals believing it to be haunted by the ghosts of revellers who fell off balconies into the river below, and others saying of ghosts of indigenous locals who jumped off the Tequendama Falls to escape incarceration as slaves. The hotel was recently re-opened as the Museum of Biodiversity and Culture to highlight the work being put into the rejuvenation of the Bogota River, alongside the history of the local people. Why can't I carry-on my duty free alchohol?